Specially designed for printing onto towels, tiles, etc., the OK-VIKTOR large-throat platen press is a durable, reliable, and affordable machine perfect for smaller print operations. This single station heat press has a convenient table top design and an optional stand for added versatility. With a 10” platen gap, loading is hassle free. And the option of top and bottom heat ensures you receive the level of heat distribution you need. 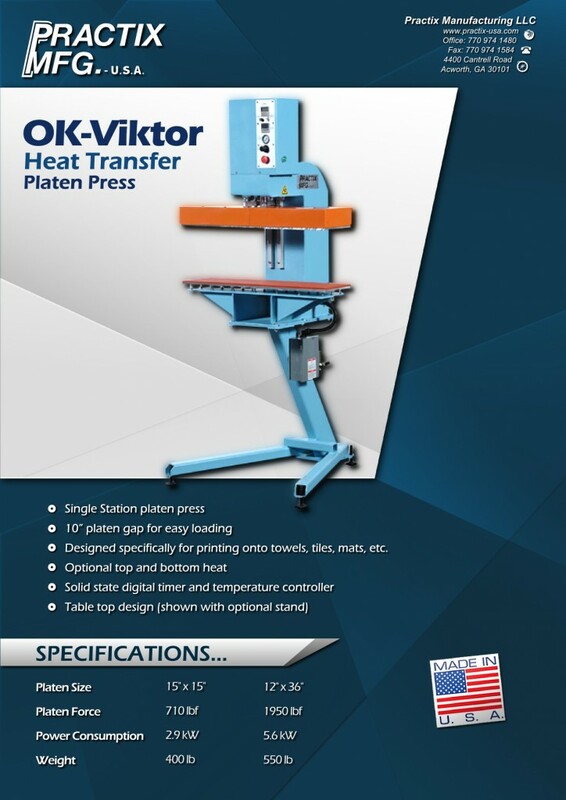 The OK-VIKTOR platen press also comes standard with a solid state digital timer and a state-of-the-art temperature controller for even more precision. As an added value, every heat platen press from Practix can be customized to meet your workplace’s height and color requirements. And all of our platen presses come backed by our one-year mechanical warranty and a six-month electrical warranty. Plus all Practix heat transfer machines are manufactured in a unitized design with a forged steel frame for unmatched durability. Practix offers next day and worldwide shipping options to accommodate customers anywhere in the world. So whether you own a local print shop in Tampa, FL, or produce souvenirs in Boston, MA, we can get your new, custom platen press to you without delay.